The warm spices you'd expect during the holidays are what Amanda Faber uses to make her Apple Cider Linzer cookies stand out during the "Finals Week" Showstopper bake. The taste of mulled apple cider is baked into the cookies, which are sandwiched with apple jam and elegantly dusted with confectioner's sugar. Each of Amanda's Winter Celebration creations are meant to remind you of warm beverages, and hopefully her flavors will blow the judges away in this "Finals Week" challenge. Watch the full episode of "Finals Week" from The Great American Baking Show Season 2 episode 8. 1. Quarter the apples and combine them in a small sauce pot with the water, apple juice, orange juice, lemon juice, and salt. Cook at a boil for ~1 hour or until the liquid is about one cup. 2. Strain the liquid and add water if needed to make 1 cup. Return to pot. 3. Cook with the pectin until strongly boiling. 4. Add the sugar and food coloring. Boil for 1 minute. 5. Pour into a metal bowl and chill. 1. In a large mixing bowl, combine the salt, baking powder, flour, cinnamon, allspice, and cloves. 2. In the bowl of a stand mixer, combine the orange zest and butter. Cream together. 3. Add the sugar to the butter. Beat until well combined. 4. Add the egg, egg yolk, and vanilla. Mix until combined. 5. Add in the dry ingredients. Mix until combined. 6. Divided the dough in to 2 portions. 7. Roll the dough until 1/4 inch thick between 2 pieces of plastic wrap. Freeze. 8. Once frozen, cut with cutter to create 12 solid circles and 12 rings. 9. Bake at 325° F/162° C for about 12-16 minutes. Pull out at first signs of browning. 1. Spread a small amount of jelly on solid cookies. 2. 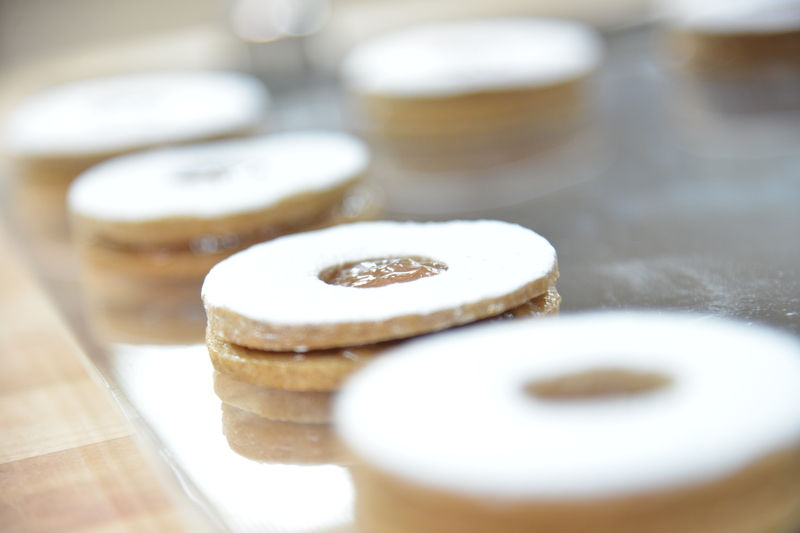 Dust ring cookies with confectioners sugar.